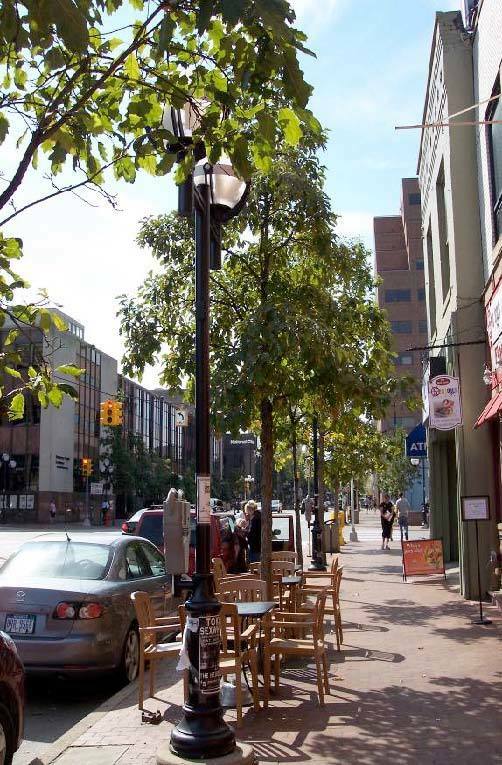 To achieve improved street and sidewalk design, a municipality may choose to make capital improvements to its existing stock of streets and sidewalks. It may also choose to enact subdivision and land development regulations that require new development to provide infrastructure and conform to design standards. The following sections address the matter of establishing appropriate types of street and sidewalk design and current trends in transportation planning. The subsequent sections address the matter of implementing the desired design, whether through direct capital investments by the municipality or as an update of its ordinances. An important part of deciding what types of street and sidewalk design are appropriate for your municipality involves a review and assessment of the current transportation modes (automobile, pedestrian, bicycle, and transit), taking stock of the existing and expected future land uses of the community, and community needs and desires which can be ascertained through community visioning sessions or simple discussion. The community setting should influence the chosen design as seen in the photos at right. In rural communities, wide road shoulders may be the most appropriate way to accommodate pedestrians and bicyclists. In urban areas, sidewalks at least 5 feet in width are likely appropriate. In urban settings with a mix of uses, wider sidewalks are sometimes essential for high pedestrian traffic areas. 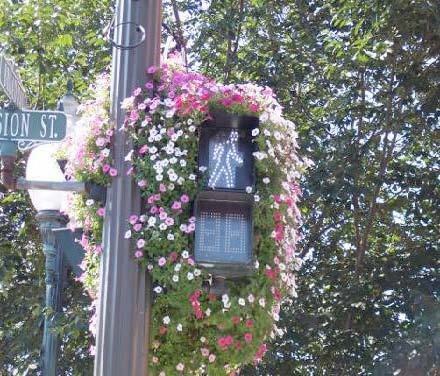 Streetscape elements can vary from a simple landscape strip in a rural setting to many elements such as street trees, pedestrian lighting with banners, and hanging baskets in areas with larger pedestrian traffic (see further discussion below). The number and spacing of commercial driveways and entrances/exits – are they excessive, adequate, or insufficient? Complete Streets refers to streets that are designed to accommodate a variety of users (pedestrians, bicyclists, motorists, and transit riders). Complete streets policies address the accommodation of people with disabilities to those of a range of age groups. Elements of complete streets typically include either bike lanes or wide shoulders to accommodate bicycles, bus lanes, transit stops, and pedestrian accommodations such as sidewalks, traffic calming measures, and streetscape elements. The specific design of complete streets varies according to the community setting (i.e. rural, urban, suburban) and the type of road. Context sensitive design is an approach to the development of transportation infrastructure that reflects and preserves an area’s scenic, aesthetic, historic, or environmental resources and community needs and desires. The intent of such design is to have continued public involvement throughout the development of any new transportation infrastructure with the end product addressing the needs of stakeholders. 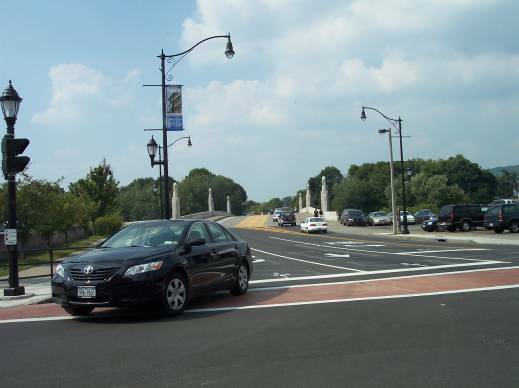 Context sensitive design improvements can be as simple as the installation of pavers or textured surfaces to a project as significant as a complete bridge rehabilitation. ContextSensitiveSolutions.org provides a number of case studies of the use of this approach including a few examples in Pennsylvania such as the Danville-Riverside bridge replacement over the Susquehanna River. This bridge replacement included the erection of a new weathered steel bridge with a traffic alignment going beneath two blocks of the West Market Street Historic District in Danville. The photo in the right shows an example of a context sensitive bridge, lighting, and pedestrian facilities. Additional case studies and resources can be found at PennDOT’s website. The case studies provide before and after photos, an overview of the project, and lessons learned. The Main Street Annville project, for example, began simply as a resurfacing project but through local coordination with PennDOT also included streetscape improvements including curb bump-outs, street trees, landscaping, and patterned sidewalks and crosswalks, among other improvements. 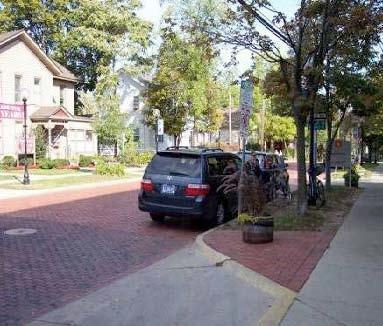 Traffic calming describes a set of design and management strategies meant to slow down motor vehicle traffic to improve public safety and improve conditions for non-auto users.. See the guide Traffic Calming (pending) for coverage of this aspect of street and sidewalk design. A road diet reduces a street’s number of travel lanes or the width of those lanes in order to achieve systemic transportation improvements. The wider the street, the faster drivers tend to drive. Sometimes this is too fast to be safe for the location. Narrowing the road or lanes changes the driver’s perception of the safe speed to travel, thereby encouraging slower driving. Narrowing roads or lanes can also free up space for bicycle lanes or other purposes. See the guide Traffic Calming (pending) for coverage of this aspect of street and sidewalk design. Traffic calming elements such as raised medians, pedestrian refuge islands within medians, roundabouts, bump outs, etc. A Federal Highways Administration safety review found that streets designed with sidewalks, raised medians, better bus stop placement, traffic-calming measures, and treatments for disabled travelers improve pedestrian safety. Some features, such as medians, improve safety for all users: they enable pedestrians to cross busy roads in two stages, reduce left-turning motorist crashes to zero, and improve bicycle safety. Why should a municipality update its street and sidewalk design? Improved Public Safety – Good streetscape design enables communities to implement options that improve safety of all residents, including pedestrians, cyclists, and motorists. Improved Mobility – Designing infrastructure that provides people with transportation choices, rather than confining them to one mode of travel, better accommodates the needs of people of all ages and people with disabilities. Environmental Impact and Health - Creating more connections between streets, parking lots, buildings, and destinations can reduce the number of vehicle miles traveled, vehicle trips taken, and encourage walking and bicycling. This is good for physical health and encourages healthier, less sedentary lifestyles. Improved Livability and Quality of Life –Including streetscape elements and updating street and sidewalk design make an area more inviting, fosters more interactions by people and improves the pedestrian experience. Economic Benefits – Good design encourages business investment and may increase property values. In commercial districts, more transportation choices allow for increased access for both shoppers and the workforce. Design improvements can help attract new business. In residential areas, safe, attractive, and walkable streetscapes are an added value to potential buyers. Environmental Benefits– Landscaping can enhance stormwater runoff management, provide cooling shade, and improve air and water quality. It also helps to reduce the heat island effect for pedestrians, reduces noise, and soaks up carbon emissions. Municipalities may improve existing streets and sidewalks, funding these improvements via state and/or federal grants, using tax revenue on a pay-as-you-go basis, or through borrowing (bonding). These improvements will require varying degrees of maintenance. In some communities, sidewalks and streetscape improvements may be maintained through local businesses or main street organizations/business improvement districts. Typically, street and sidewalk design regulations are addressed in municipal subdivision and land development ordinances. However, street and sidewalk design elements may sometimes also be found in specific zoning ordinance sections that deal with design such as a Town Center District or a Traditional Neighborhood Development District. Typical subdivision ordinance content for street and sidewalk design is discussed below. Functional class of streets for a municipality based upon the American Association of State Highway and Transportation Officials (AASHTO) standards and used by PennDOT- arterials, collectors, local roads, and private streets. These streets are often designated on a municipality’s official map. Residential private street standards including ownership, paving standards, right-of-way requirements, and maintenance procedures. An example of a subdivision and land development ordinance from Pennsylvania that addresses many of the topics discussed under the design standards and technical and engineering standards sections above is: Lancaster County’s model Subdivision and Land Development Ordinance. This model has different requirements for different settings (i.e. urban, rural, infill development). The street standards include illustrations for right-of-way and cartway width standards and cul-de-sac (single-access street) design. Many municipalities have adopted design guidelines for street and sidewalk construction and retrofit design. The City of Burlington, Vermont’s draft design guidelines addresses Complete Streets principals and provides design guidelines for different street types. Existing streets and complete street right-of-ways and streetscape elements are illustrated to provide guidance for street and sidewalk design. The City of Tacoma, Washington has adopted Complete Streets design guidelines for residential streets and mixed-use center areas. Another useful resource is “Making Your Downtown Improvements Last: Design, Installation, and Maintenance Guide” by the Montgomery County, Pennsylvania Planning Commission. This publication provides information on different types of street and sidewalk improvements as well as provides a discussion of maintenance of improvements. A municipality may more effectively provide for future streets and sidewalks by identifying their locations and reserving the necessary land on an “official map.” By reserving the land, the municipality expresses its intent to acquire that specific land at some future date. This reservation or expression of intent does not affect existing property ownership; landowners still own and control their land. However, the owners are constrained in building on, subdividing, or otherwise developing the reserved land until they provide written notice of intent to develop and then allow the municipality up to a year to acquire the land from them. See the guide Official Map [LINK] for more information. Katherine has over ten years experience in community planning with expertise in developing and managing comprehensive plans and land use studies, land use regulations, design guidelines, open space plans, and strategic plans. Katherine also has experience in site plan review and GIS map development as well as grant application assistance. Katherine Ember, AICP of Planning4Places, LLC is the primary author. PALTA staff were contributing authors. Photos provided by Planning4Places.